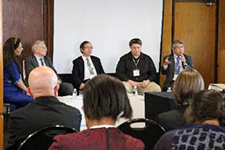 The Science Forum South Africa (SFSA) hosted by the South Africa Department of Science and Technology (DST) is the largest scientific open forum in Africa. 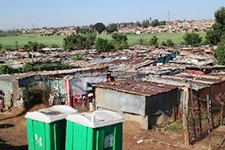 It was held in Pretoria (the administrative capital), focusing on “Well-being and prosperity through science and technology innovation.” More than 2,000 individuals from over 60 countries of Sub-Saharan Africa (mostly from South Africa), Europe, America and Asia attended the forum. The participants were policymakers, athenaeums, laboratories, and researchers. JST hosted some sessions and took the rostrum, and jointly exhibited a booth with the Embassy of Japan in South Africa, etc. The exhibition booth “Japan Knowledge-Research and Higher Education Opportunity” of the Embassy of Japan in South Africa —the sole booth from Asia—was jointly organized by JST, JICA, and the South African Embassy in Japan. 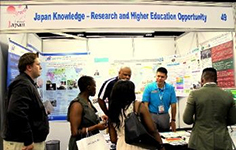 The joint booth introduced the initiatives for Africa in “Japan’s knowledge－opportunities in higher education and research.” In the two days, more than 150 individuals visited the joint booth. The visitors were interested in the opportunities of research collaboration and study in Japan, including the “Securing Environment and Water Resources,” a research supported by SATREPS. The joint booth was selected as one of the three most excellent exhibitions by DST and South Africa S&T Minister Pandor Minister Pandor of Science and Technology presented the award at the closing session. 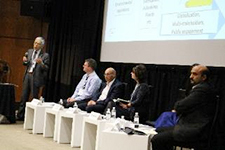 During the forum, the representatives of the six main world-wide scientific forums—the American Association for the Advancement of Science (AAAS), Euro Science Open Forum (ESOF), World Science Forum (WSF), Latin American and Caribbean Open Science Forum (CILAC), SFSA, and Science Agora in Japan—held a mini-session to improve their presence in Africa and enhance collaborations among the organizers. The discussion highlighted the difference of each forum, but also confirmed the common issues. For example, there is the need to encourage young people to get plugged-in to science and technology. So far, JST has collaborated with the African countries via international cooperation promotion projects for promoting international cooperation and the government-led Tokyo International Conference on African Development (TICAD). JST also has deepened collaborations with DST, the South African Agency for Science and Technology Advancement (SAASTA) and the South African Embassy in Japan through the open forums such as SFSA, ESOF and Science Agora. Based on these collaborations, JST will continue the discussions to find solutions for the global issues, together with the scientific forum representatives and the stakeholders in the scientific communities. The 3rd SFSA will be held Pretoria in December 2017. 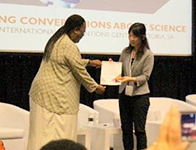 Receiving the exhibition award from South Africa Science and Technology Minister PANDOR. Copyright©2017 Japan Science and Technology Agency.